The following books and online resources were used in the preparation of this document. Alexander Bergs (2001) Modern Scots draws together a wide range of 20th century research on the modern tongue to provide the best detailed descriptive grammar of current usage. 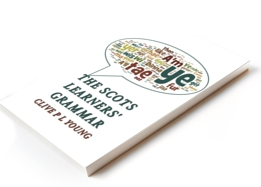 Caroline Macafee (unpublished manuscript 1980, revised c.1992, edited 2011) Characteristics of non-standard grammar in Scotland is a detailed account of modern linguistic research, similar in scope to Bergs. Currently unavailable online.